The one argument used by Tory MPs to shore up the unalloyed nastiness of Tuesday’s Benefits Bill – the first to cut benefits in real terms for nearly a century – was that it was wrong for benefits for the unemployed to have risen by 20% since the financial crash while wages for those in work have only risen by 10%. But people don’t buy things in shops with percentages; they buy them with money. And in money terms 20% of the £71 a week JSA is £14, whilst even for the lowest-paid in work 10% of the national minimum wage is £23 a week. So actually even those with the lowest wages are £9 a week better off than those on benefit. But of course the sole Tory argument isn’t just wrong, it distracts from what’s really going on in society. Unemployment benefit has already been halved in value relative to average wages over the last 30 years, and now JSA claimants on £10 a day (how many Tory Ministers have tried living on that?) are set to have a further £1 a day taken off them. At the same time some 8,000 millionaires, including many in the Cabinet, are about to receive a tidy handout of over £2,000 a week from the repeal of the 50% income tax rate. Even that is dwarfed by the staggering gains over the last 3 years of austerity of the 1,000 mega-richest in the country totalling £155bn according to the Rich List. This bill has nothing to do with deficit reduction. Its real purpose is very different. It is intended to demonise the jobless as shirkers, even though there are today only enough job vacancies for 1 in 8 of those chasing them, and to tarnish Labour as a friend of ‘scroungers’ (though the 1% pay cap will apply to hundreds of thousands of nurses, teachers and soldiers). It is intended to end the century-long commitment of all political parties, till now, to ensuring that those forced to depend on benefit should not be made to suffer a real terms cut in living standards. And it is intended to vilify Labour, in rightly voting against the bill, as the party in denial of the need for deficit reduction (so why doesn’t Labour spell out the jobs and growth strategy which it supports and which is the only real answer to large-scale budget deficits?). Posted in: Benefits, Economy, Pensions, Poverty/Low Pay, Public Spending, Social Affairs. Just before coming onto this site I was looking at the Official Labour Party Site. Would you believe it not a thing about this iniquitous piece of legislation. Its almost as if they are too scared to stand up for the poorest and most downtrodden in the UK. In fact the whole site is just a PR man’s dream come true. Asking for money at every opportunity and being vacuous and irrelevant to everyday problem of working people. Where the devil can people like myself go to vote as the Labour Party seem very similar to the Coalition. Sadly in all that you right I agree, problem is when you talk about the political parties labour used the right wing press to push home the battle against the sick the disabled and the unemployed. I really do not see a difference in Miliband and Cameron. I jacked my L.P. membership in a couple of months ago – it the National Health Action Party all the way, tooth and nail, for me now. If Leveson report is implemented in full One Nation Labour might get better media coverage and refute these welfare scare stories. Refute these welfare scare stories. You mean ATOS is not that bad and that Labour broughtb them in without taking any notice of the disabled. Today Miliband stated the best pay out of poverty is working yet yopu look at me I have done everything in my power to find work and I cannot 2200 applications three answers all said no. The fact is in this country we have no need to employed the medically unfit and most employers do not have a social conscientious they want people to be able to work. Labour has nothing to offer the disabled. So what you read in the right wing media is factual? Yes totally agree with your views on ATOS and there are dreadful stories. What needs challenging is the targeting of least fortunate and asking why big corporations avoid tax i.e. the top 1% who seem to receive little press coverage on recent financial disasters. Instead we get stories of skivers vs. strivers headlines…these are the scare stories I’m referring to. If you taxed the rich and the companies it would not help welfare, the simple fact welfare has become a target for all parties, looking at Labour under Miliband are you saying he’s to the left if he is then it’s not the left I remember. 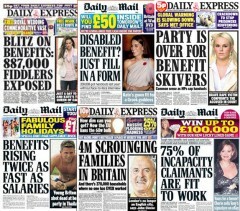 The problem is not the right wing press it’s the three major parties all being right wing. Welfare is a target for all parties maybe they are right perhaps it’s time to re look at Hitler.